New Zealand produces some truly spectacular cheeses. I’m always excited to see the wonderful range and quality being produced up and down our glorious land and we, as consumers, now appreciate a wider variety of cheese than ever before. This Three Cheese and Kale Pie recipe of mine incorporates three wonderful NZ Cheeses. This pie is a play on the Greek spinach and feta pie (Spanakopita) but I’ve tweaked it a bit to lighten it up (less pastry and butter), used kale instead of spinach (though either is fine), and twisted the variety of cheeses to add a unique NZ flavour combination. This tasty pie is something the whole family will love and just the ticket to serve for lunch or a light dinner. 1 Preheat the oven to 190°C. Grease an ovenproof pie dish with butter or oil. 2 Coarsely chop kale and place in a bowl with garlic, breadcrumbs, three cheeses, thyme and eggs. Season with salt and pepper and mix well. 3 Spoon mixture into prepared dish and press with the back of a spoon to smooth the surface. 4 Cut the roll of filo pastry sheets into 2cm thick sections. Toss the sliced filo on a board to separate into ribbons. 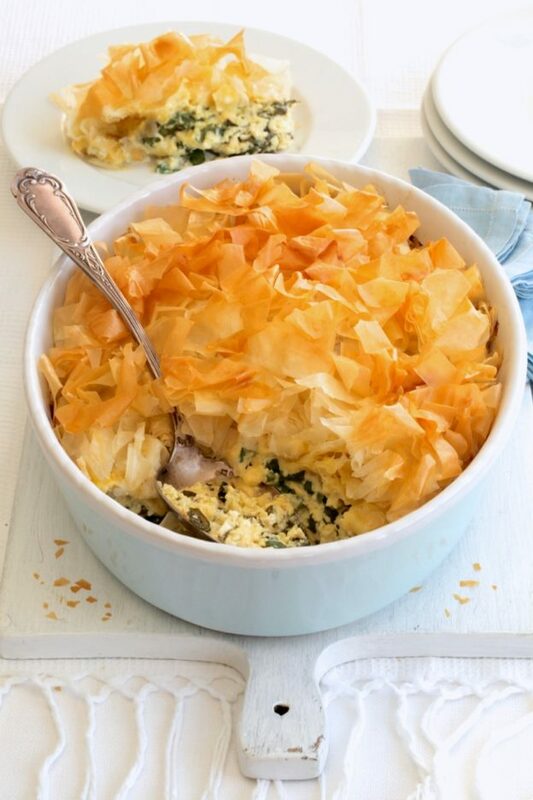 Completely cover the cheese mixture with the pile of filo ribbons and spray lightly all over with olive oil. 5 Bake for 30–35 minutes or until the filling mixture is set and the filo pastry is golden brown. Serve hot or warm. This entry was posted on October 9, 2017 by julie.